Many thanks to everyone who gave us a quilt, top or block. Over the 4 days we received a total of 178 and these were distributed among our coordinators who came to the show. We would also like to thank you for your support through the purchase of the various items and raffle tickets we had on sale. 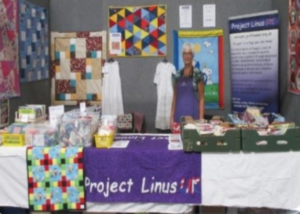 The Sewing Place had a challenge and some of the ladies who took part donated their quilts to Project Linus UK. There were 9 in all. The October workshop in Edinburgh is full with a waiting list! 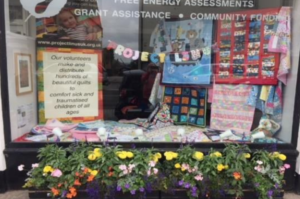 We have a Project Linus display at a shop Be Green in Dunbar High Street for 2 weeks. The organisation gave us a grant for £240 recently and asked if we’d like to use their window. We’ve had quite a lot of interest. People are going into the shop to ask if the quilts are for sale, the answer is no, but you can have one of our leaflets or help us make them. We’re delighted to announce that Edinburgh Linus Group have been awarded £1,500 by Foundation Scotland. This is to contribute towards the purchase of fabrics, fleeces and wadding for quilts. 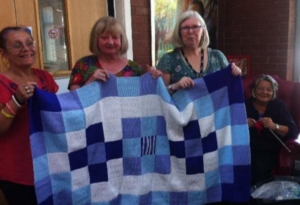 A knit and natter group meet weekly at The Brain Charity in Liverpool and knit squares for blankets which they donate to Project Linus. 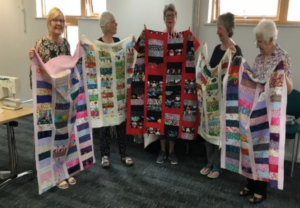 Amanda who set up the group says making squares is ideal for people who have difficulty following patterns and that if people are not well enough to come to the group they can knit at home and still feel involved. She has watched people blossom in confidence and is now teaching people to knit – she loves it when you can see it just click! I just wanted to share a story with you for the newsletter to show that all our work is appreciated. I broke my arm 9 weeks ago on the first day of my holidays by falling out of my brother-in-law’s campervan. While I was on holiday last week in Scotland I received a beautiful bouquet of flowers via Interflora. They were sent from the Trustees of the Children’s Cancer Unit Charity because I send quilts to the unit. I thought it was so lovely of them to think of me. 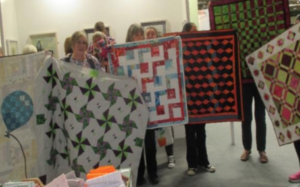 The lovely people at Jubilee Quilters in Ossett, West Yorkshire, have made 30 quilts and 2 blankets for Project Linus. They have been quilting and stitching together for many years supporting local hospitals and charities with their beautiful work. I was invited to join them for lunch to collect the quilts. They always have a buffet, which was delicious. We spent the afternoon together labelling and cataloguing everything. The quilts will be given to a local children’s hospital as well as the St Augustine’s Centre in Halifax who support refugee families in Calderdale. 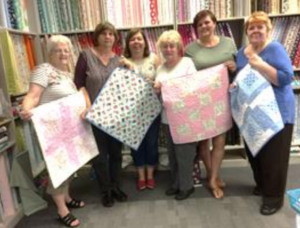 The results of a recent workshop at Handmade by You, Maryport, with owner Lisa Harrison and members of the Thursday quilting group. The ladies hand pieced the blocks which I then machine stitched together and quilted. Everyone thoroughly enjoyed the day and we are looking forward to another workshop before Christmas. Thanks to all involved.